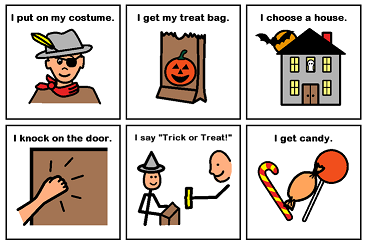 In honor of International AAC Awareness Month I am posting a freebie on TPT: Trick or Treat Sequencing cards. The download contains 9 cards delineating the individual steps when going Trick or Treating. I made them using Boardmaker icons and was planning to use them with our Special Day Class population. Feel free to use these cards in a social story or to work on sequencing skills! Enjoy and have a happy and safe Halloween 2013 :).